The future of online dating in South Asia is bright and this is the recent development that has happened in southern part of Asia especially in India. Matrimonial sites are dominant and very popular in India like Shaadi.com and Bharatmatrimony.com to name few. There is separate segment of college attending young Indian online singles hooking up through social networking sites and group networking sites, which is understandable at this age. However, there is segment of singles graduated from college, working and do not want to get married before say 28. They did not have enough options to find the potential dating partner and thus far the word “Dating” is taboo in India society. However young, out spoken and independent online singles from urban India is changing the we date such as the new dating site from India, TwoMangoes.com. TwoMangoes.com work on a similar model as Jumpdates.com and has been created with the user in minf. As a member you need points to connect with other singles and for that you need to be active on different sections of the site. You get mangoes on TwoMangoes.com as you become active and this has been designed and developed giving priority to Indian online singles. There are a few dating sites in the Indian market like Zoosk.com and GirlsDateForfree.com. But, that is again mainly used by singles looking for online friendship and could be that they also have their facebook app. TwoMangoes has created some buzz after the launch, touching the taboo subject of dating in Indian society especially amongst the older generation. Website holds lots of potential and ample market to explore being the lone player in the online dating industry in India but it does still have long way to go. The success of free online dating sites is known to all today, as it is the best place to find your dating partner. There are millions of profiles available online which guarantee that if you follow the tips of how to create an online dating profile you will find your match. But, there is competition from outside the domain from online gaming. Yes, you got it right – A recent infographics revealed by OnlineUniversity.net shows that the success of meeting someone likely for a date is more on an online gaming sites rather than free online dating sites. At Jumpdates we think that this is very common and nothing to worry about as love can happen anytime and anywhere. The online gaming industry has over 217 million active users worldwide. There are no surprises that online singles sharing the same interest will come closer given a common platform. Why does the online gaming bring like-minded singles together and create this dating opportunity. However, the question is how suitable and effective are these bearing in mind that free online dating sites are being designed with the primary intention of dating. For example, on online gaming site a single will have their own avatar and they won’t have all the details which is useful when you look for a new dating prospect apart from the about me section. You also do not know whether someone there is really available for dating, Just being single does not mean that they are available and you may not know their sexual orientation. These kinds of infographics can certainly give some food for thought but, you cannot deny the fact the popularity of online dating and to overcome their strengths by other domains such as the online gaming would pose a real challenge from the primary goals. The same can be said when we compare social sites and free dating sites in the domain sphere and expertise of online dating for singles. You must have read a lot of tips from many free dating sites blog, relationship forums and online dating coaches about how to manage your dating profile on free dating sites. You might have read tips on how to fill every bit of information in your profile, attaching recent photos to your profile, take a proactive step in sending messages to other singles rather than waiting for them to contact you and much more. However, with the recent boom of social networking, the world of the internet has become the most happening place. Social platforms like Facebook, Twitter, Google+, MySpace, Quora, last.fm, pinterest.com and the list goes on and on. These social networking sites give online singles an opportunity to broadcast their dating profile on free dating sites giving them a greater chance of finding your ideal mates. 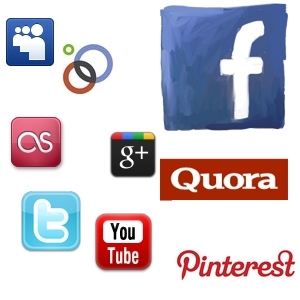 •	On Facebook and Google+ – Facebook is biggest social networking right now and Google+ is also gaining much momentum. You can share your presence on free dating sites by sharing your profile with your friend. The best thing about facebook is that you can be viewed by friends of your friends, thus opening up your single status to people who may indirectly know you. •	On YouTube and Last.fm: YouTube and Last.fm are the places which gives you the best platform to connect with someone that shares similar music interest as yourself. Sharing your profile link while commenting on these sites would also increase your chances to get more hits and hence dates. You can also add your dating profile link to your website box of you profile. •	Quora.com – Quora.com is the best place to find answers to your question. Millions of users login every day to find answers to their relationship issues. This is also a good platform for online singles to share their dating profile. Why not put forward your views on relationships, you never know who could be around the corner. Although your dating profile is very popular on free dating sites and you may receive plenty of messages but some online singles may not be wholly satisfied with the responses or types of persons you are finding. Social platforms are a great way to increase your visibility by areas of interest, circle of friends and many other common traits. Remember the saying ‘birds of a feather flock together’. This is very important for social networks and you maybe surprised by the results by following this strategy.